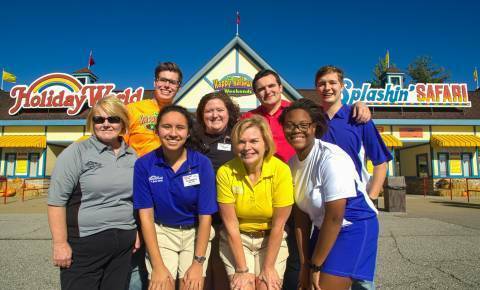 SANTA CLAUS, IND.—–Holiday World & Splashin’ Safari officials expect to receive a record number of job applications as they prepare to fill 2,200 seasonal positions in the coming weeks. Most of the park’s seasonal positions are available to applicants who will be 16 years and older by April. A limited number of jobs require a minimum age of 14 years on the date of application. Retirees and other adults seeking seasonal employment are also encouraged to apply. Job seekers should visit HolidayWorldJobs.com to fill out an online application. Seasonal benefits include a personal Season Pass, park food and merchandise discounts, employee parties, incentive and awards programs, free admission to other parks, and more. This season, the park will again offer an Employee Transportation Program for seasonal employees who would not otherwise have a ride to work. Available at a nominal fee, bus rides will be offered from Evansville, Newburgh, Boonville, Lynnville, Haubstadt, Huntingburg, Jasper, Ferdinand, and Tell City, Indiana, plus Owensboro, Kentucky. Holiday World opens its 73rd season on May 4 with the premiere of Santa’s Merry Marketplace; Splashin’ Safari’s opening day is May 9. For more information about seasonal and full-time job opportunities, visit HolidayWorldJobs.com. Please email hr@holidayworld.com or call 812-937-5252 with employment questions.